When you need a quick pasta dish that the whole family will like, try out this recipe. It’s a one dish meal. 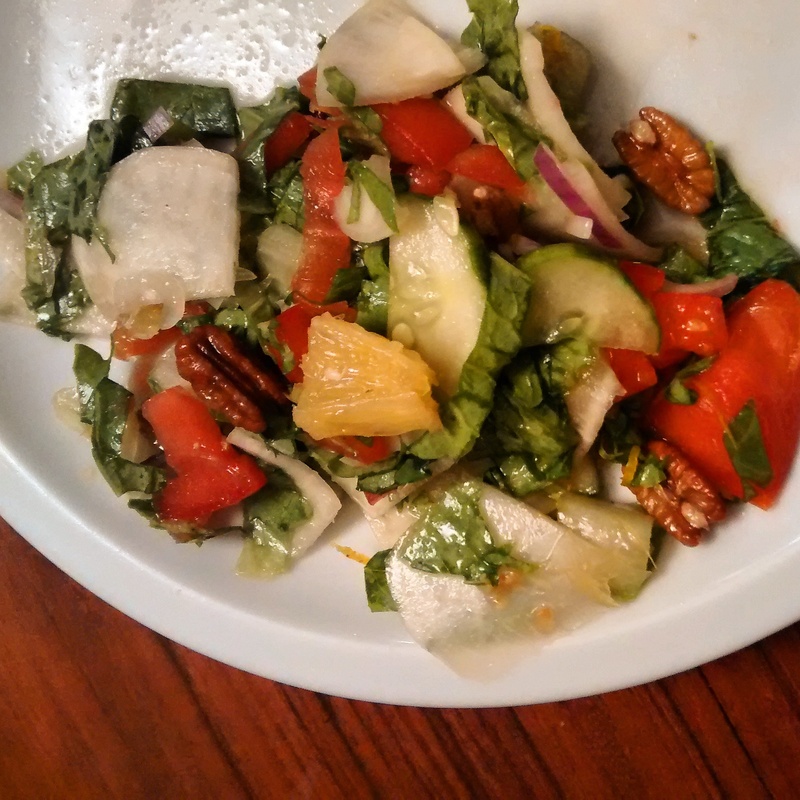 You can serve a green salad on the side also if you want more veggies (3 out of 4 of us at that too). My boys both loved it, but who can blame them with bacon, bacon fat and spaghetti? I used this recipe from Tasty Kitchen as a base, but tweaked it a bit. 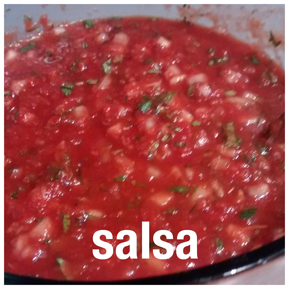 I cut the recipe in half, which was perfect for my family (2 adults and 2 small kids), but adjust it to your needs. In a skillet with lid (contains splatters), fry the bacon. When done, remove bacon onto paper towel. Leave bacon fat in pan (this is the good stuff). 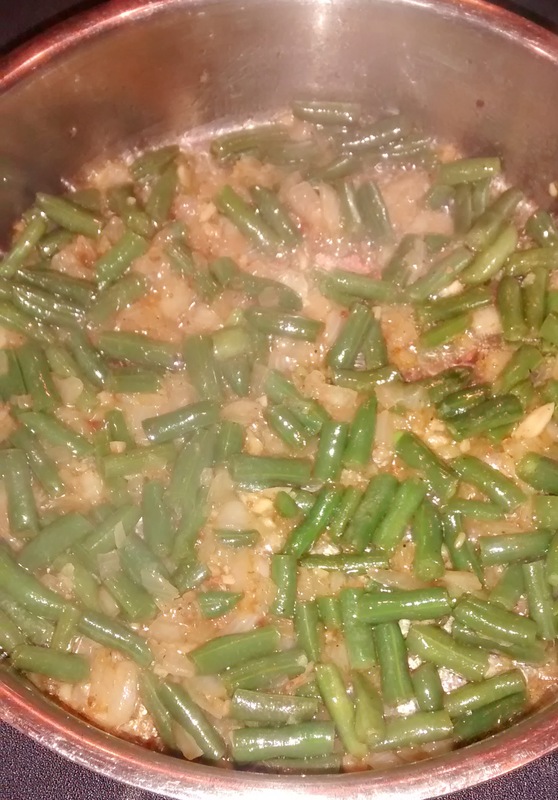 Sautee onion and garlic in bacon fat for three minutes, and then add in green beans. Cover and cook for about 8 minutes. Stir periodically, and cook until beans are done to your liking. Place milk (or cream) and cream cheese in a small saucepan. Heat over low heat until cream cheese is melted, and whisk until smooth. Remove from heat. Add the parmesan cheese, egg, and pepper. Whisk until blended. Drain pasta (reserving 1/4 cup of hot water) and return to pot. Immediately add the white sauce and toss to coat. The hot pasta will cook the egg. Dump pasta mixture and crumbled bacon into the pan with the veggies. Add the reserved pasta water to loosen the sauce. Every meal that I prepare begins in the same place, at the cutting board. I love to prep the meal by cutting, chopping, and dicing all the ingredients I will need before I ever turn on the oven or stove. The cooking process is so much smoother and faster when you don’t have to stop and chop veggies between steps. I place great stock in the knives that I use and take great care of them. Get a good knife, treat it properly, and it will have a very long life. If you don’t treat your knives well, it doesn’t matter what quality of knife you buy, they will not last you. Top of the line knives can dull, pit, or rust from misuse (even stainless steel, don’t be fooled). So, if you’re looking for ways to care for your knives, here are a few tips from my kitchen to yours. First, make sure you have an appropriate cutting board. Wood or plastic are the two best options out there as they are softer, providing more give against your knife and therefore doing less damage to the sharpened blade. If you have a board made out of a hard surface with no give (glass, marble, stone), get rid of it! Contact with a cutting board is the most frequent cause of a dull blade. Even if you are careful about your blade and cutting surface, your knife will dull in time. You will need to sharpen your blade with some regularity as your knives begin to dull. I cannot recommend a specific timeline for this as everyone uses their knives with different levels of regularity. The picture below shows an extreme example of wear on a knife. The knives are from Iron Chef Morimoto’s restaurant. The top knife is new and the bottom is one that has been used for three years. If you notice your knife start to dull or if you feel yourself using more force to cut an object, please make sure and sharpen your knife (Many knife companies will even sharpen your knives for you if you don’t feel comfortable doing this yourself!). Finally, washing and storing your knives are important. NEVER wash your knives in the dishwasher. The heat and abrasive chemicals will damage your knives faster than any other method. Instead, hand wash your knives directly after each use with warm water, mild dish soap, and a soft sponge. Dry them directly after and store them. store them either in a drawer or a knife block. If you store them in a drawer, it is best to leave them in their sheath. When using a sheath, though, make sure it is not leather, as leather will hold moisture which can pit your blade. Storing your knives in a knife block is the best option, and I tend to recommend standard wooden knife blocks. If you follow these simple steps to caring for your knives, your knife set should last you a long time.